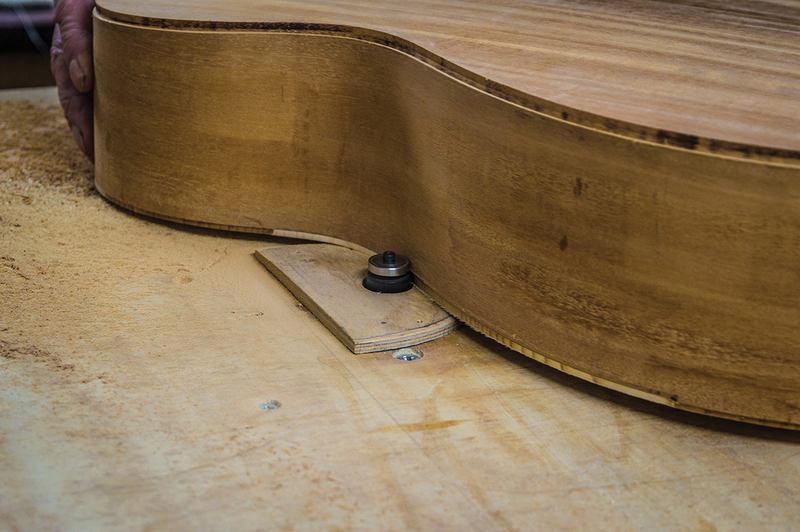 Let’s start with a confession and reveal that I don’t enjoy routing acoustic-guitar bodies for binding. 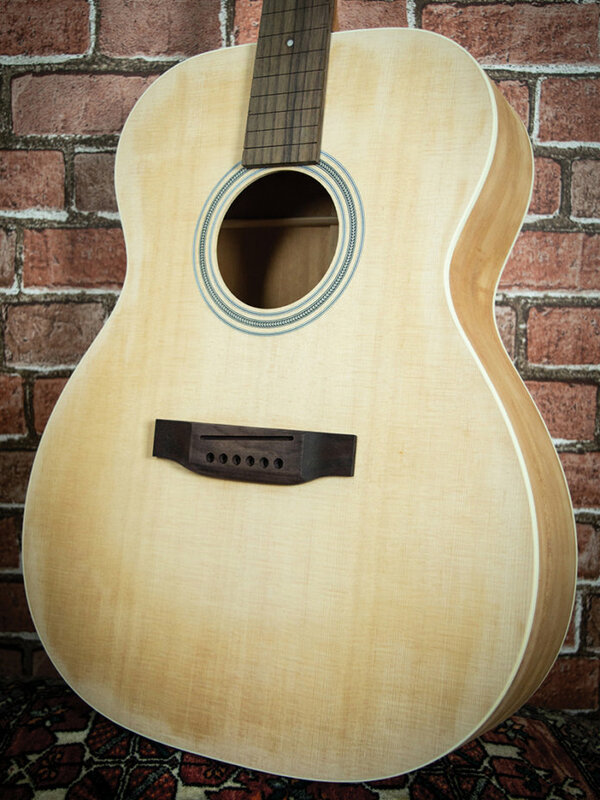 This is the fourth acoustic I’ve built, and I’ve never been entirely happy with the way the binding has turned out on any of the previous ones. There are two reasons for my ambivalence. Firstly, the sheer stress of knowing that one slip, or lapse in concentration, and the body can be ruined and all the hard work will be wasted – along with some lovely tonewood. Secondly, I’ve never been properly kitted out to do the job. All my previous attempts have involved a Dremel with a Stewart-MacDonald mini-router accessory. It’s certainly possible to rout the binding channel this way, but it’s risky. Last time round, the flimsy cutter slipped in its shank, and by the time I’d gone all around the body, the channel ended up deeper than when I started. I swore never again to use a Dremel for this job. Some people get great results with laminate trimmers that are designed for kitchen surfaces, but those can be expensive. 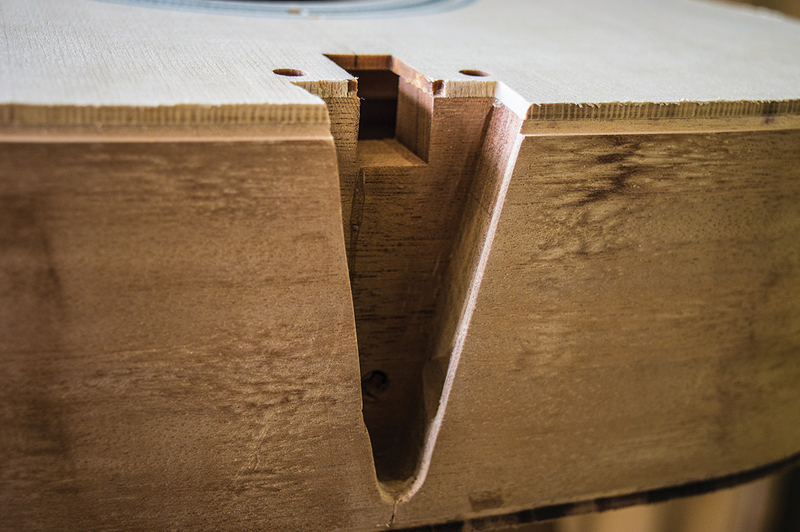 Pro luthiers often build elaborate body jigs, mounting a full-sized router in runners that allow it to ride the contours of a body. Since I so rarely need to do this, I decide not to invest in a laminate trimmer or build a routing jig. Instead, I head to Bristol to get my luthier mate to do it. With his considerable skill and vast experience, Patrick does the job using a router table and a riser that compensates for the slight arch in the front and back of the body. A special router bit is needed however, with a recessed guide bearing that’s smaller in radius than the cutter. The bearing follows the outer body edge and since it’s 1.5mm smaller in radius than the cutter, the depth of the cut should be perfect for the binding I’m using. Patrick sets the cutter height to 6mm and within minutes, the binding channels are routed. You might call this cheating, but I’m going with pragmatism! With the binding channel cut so accurately, gluing the binding is easy, and clean up will be minimal once the glue has set. Although the kit arrived with black binding, it was never my intention to use it. All along, I wanted to build something quite plain and unornamented, so I order up some 6mm x 1.5mm ivory binding from Rothko And Frost. It’s sold in 1,600mm lengths, so each strip will get around the body without any need for a join at the tailblock. I wouldn’t recommend WELD-ON 16 binding cement for multicoloured binding, because the layers tend to melt into one another. However, I’m only using single-ply ivory with no purfling, so it’s ideal for the job. Routing binding channels leaves wood burr around the edges. While it may be preferable to clean up the channels themselves if there are any raised sections, the edge burr can be left alone. Removing it risks damaging the channel edges and when the binding is glued, pressure from the binding tape will flatten the burr and it will solidify with the glue. It’s best to leave it if you want a clean body-to-binding-edge line. Another precaution worth considering is protecting the spruce prior to gluing the binding. 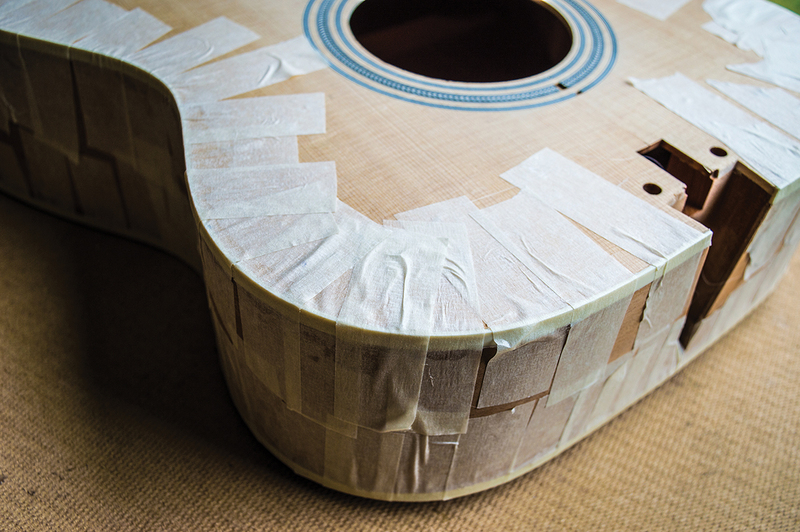 Binding tape is so sticky, it’s best not to use it with soft woods such as spruce, but even regular masking tape can pull out wood fibres when it’s being removed. 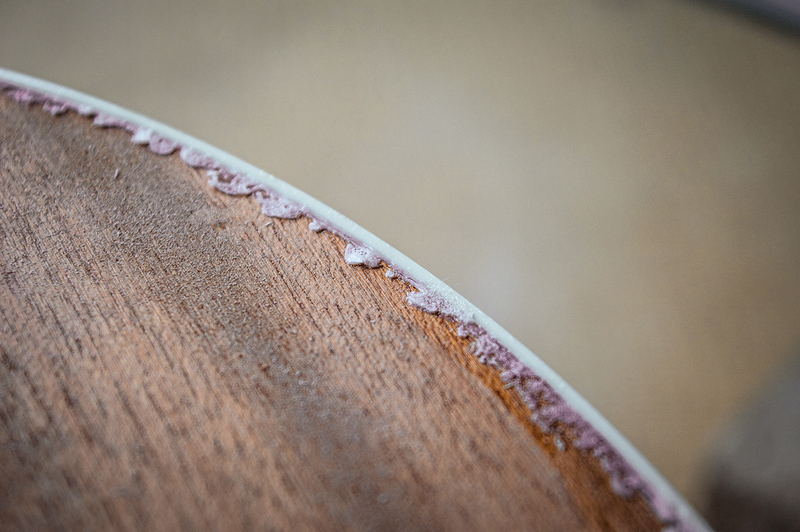 To prevent this, I spray the edges of the top with Manchester Guitar Tech’s cellulose sanding sealer. 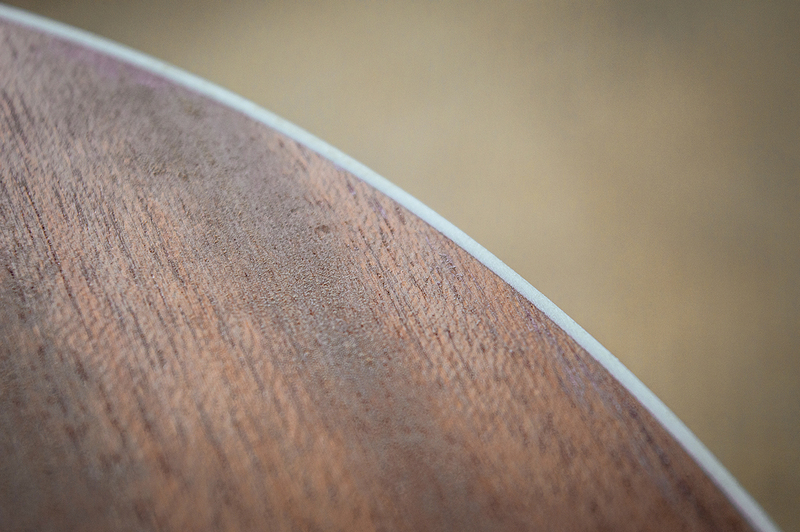 The spray is directed from the centre of the body to the outside edges to prevent the sanding sealer getting into the binding channel – much like spraying a sunburst. I’ll be using grain filler on the mahogany later in the finishing process, so I avoid spraying the sides. Sanding sealer may prevent any stain in the grain filler from penetrating the wood and the result could be a patchy and uneven colour. At this point, I also use a small saw and files to open up the neck pocket. There’s nothing about gluing the binding that hasn’t been covered in previous workshop articles. The WELD-ON 16 adhesive is liberally applied, about 15cm at a time, with the binding pressed into the binding channel quickly and firmly before being held in position by pre-cut strips of masking tape. After a full day, the masking tape is removed and 120-grit adhesive paper on a flat sanding block is used, to remove all the glue squeeze-out and to level the binding. At last, the body really is complete and I can move onto the neck. While I’ve reviewed several guitars with fibre-composite fingerboards and bridges, this is the first opportunity I’ve had to examine one as a component rather than part of a pre-built guitar. Pinching the Richlite ’board between two fingers, I look for the best node point and soon discover that, to my ears, there isn’t one. The only sound this Richlite ’board can produce is a soggy thunk. I’m more used to rosewood ’boards that produce pure ringing notes with long sustain, so it’s a bit underwhelming. Sadly, the CITES restrictions on rosewood are a well-intentioned but blunt instrument that prohibits Martin and various other guitar-kit companies from exporting the stuff. While I have every sympathy for those companies and this ongoing problem, it doesn’t have to be a problem for me. 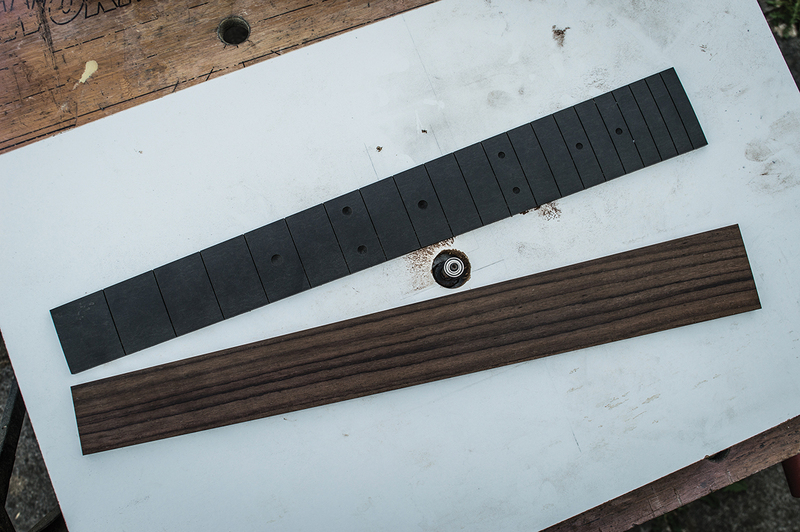 A 10-minute trawl on eBay produces a rosewood fingerboard blank for £29 and a rosewood bridge to match for £6.49 – both from a UK supplier. The bridge merely requires some final sanding, but the fingerboard blank has to be turned into a clone of the Martin ’board. Although I’m disinclined to use the Richlite board on a hand-built, all-solid acoustic, it does make a very useful routing template. I begin by placing the Richlite ’board onto the rosewood blank and drawing around it with a pencil. I need to saw down one edge, but pencil marks are hard to see on rosewood. To make things easier, I lay masking tape along the ’board, leaving it 3mm proud of the pencil line. The masking tape guides my hand saw and, before long, I have a rough-cut rosewood fingerboard that’s just slightly oversized. 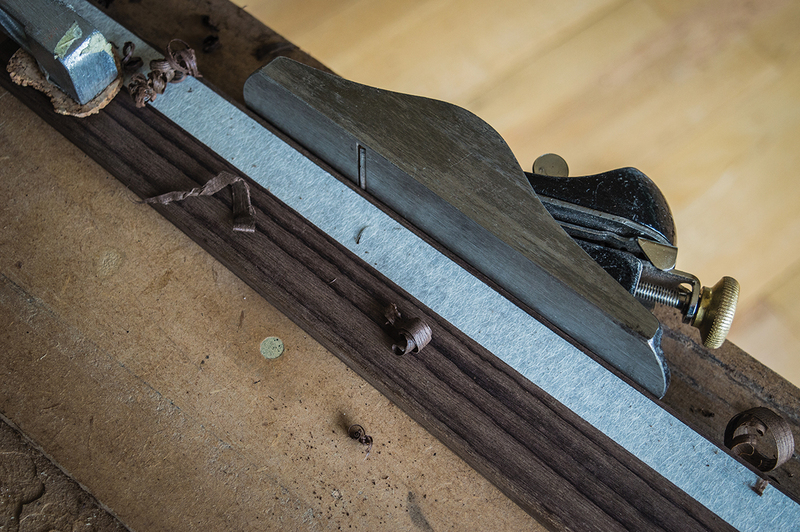 The rosewood blank is transferred to my shooting ’board and I apply fresh masking tape right onto the pencil lines. Once clamped tightly, a block plane is used to bring the edges very close to the lines, and the rosewood ’board is ready for routing. 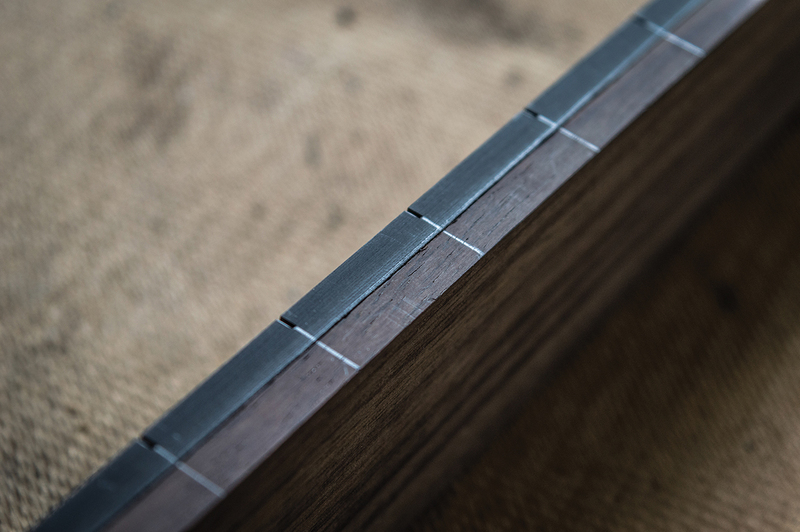 Double-sided tape is applied to the Richlite ’board’s flat back surface and it’s placed over its rosewood counterpart, leaving a millimetre or so of excess all around the edge. Properly aligned, the ’boards are pressed together and I set up my own table router with a guide bearing bit. Working my way carefully along the ’board edges, I soon have clean-cut lines that conform perfectly with the Richlite board. A handsaw cuts the two ends about 1mm proud, and the router brings them flush. Having carefully prised the ’boards apart, the Richlite and rosewood ’boards are now identical in shape and size – but the rosewood is about 2mm too thick. Over the years, I’ve gotten to know the guys at my local joinery quite well, and they have helped me on various guitar projects. They were happy to run the rosewood board through their thickness sander and that saved me a lot of effort with the block plane. Remember that it’s always worth asking, because people are usually happy to help out – especially if you’re prepared to slip them a fiver for a couple of minutes’ work. Again, the ’boards are very carefully aligned and taped together. 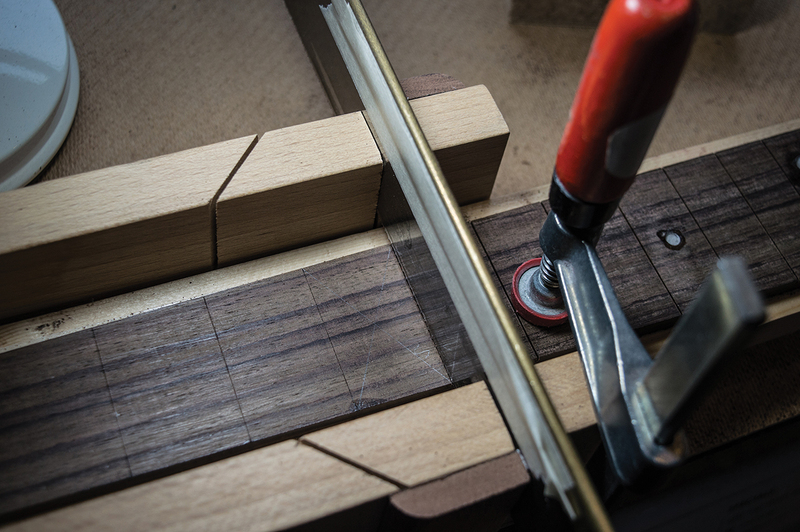 With an engineering set square, I mark the fret-slot positions of the Richlite ’board onto the rosewood ’board. If you take your time, accurate results can be achieved. With the ’boards separated again, I use a craft knife to extend the pencil lines over the edges of the ’board and after verifying the spacing with digital callipers, I score all the fret positions into the top of the ’board. Scoring the wood with a sharp knife produces reference lines that are easier to see than pencil. Martin supplied the neck with indexing pins installed and corresponding holes in the back of the Richlite ’board. 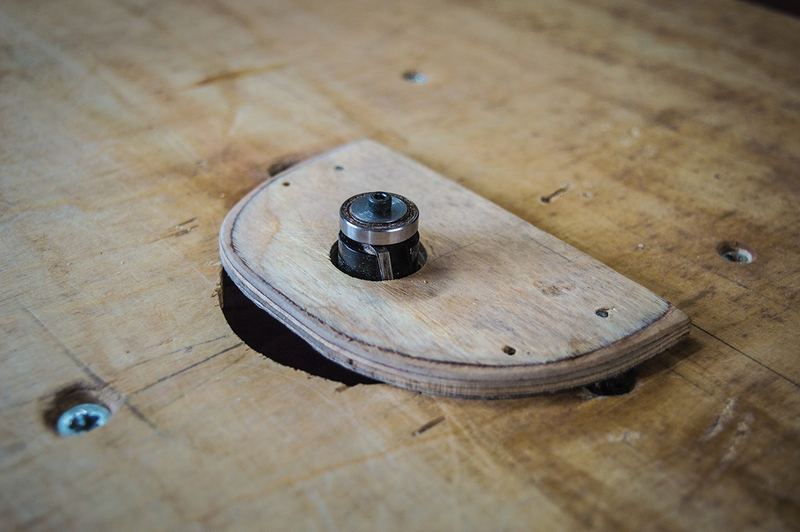 Rather than remove them and make my own, I decide to make corresponding pin holes in the back of the rosewood ’board. The pin holes are exactly 5mm in diameter, so I use a 5mm bit to extend them all the way through the Richlite ’board. 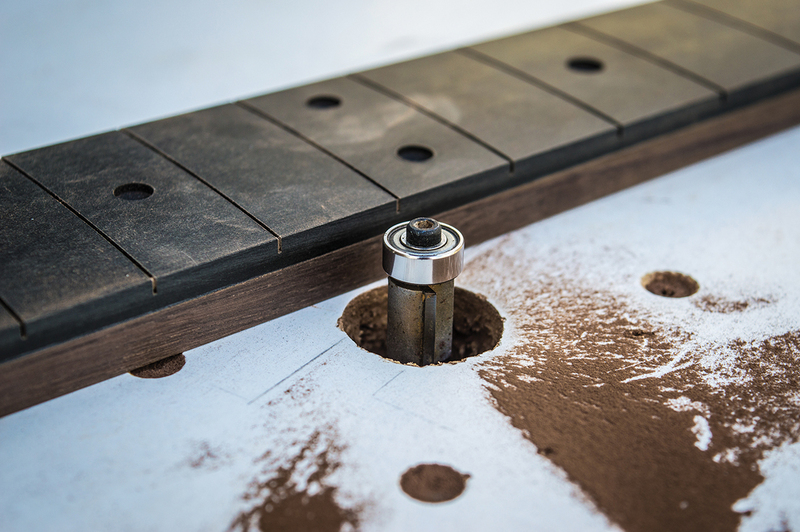 This time, the two ’boards are aligned and then clamped together with the rear of the rosewood ’board over the Richlite ’board’s radiused top surface. I mark the depth I want onto the drill bit with masking tape, and begin drilling. The holes in the Richlite ’board guide the bit and I soon have index pin holes in the rosewood ’board that slot right onto the index pins when I try a test fit. 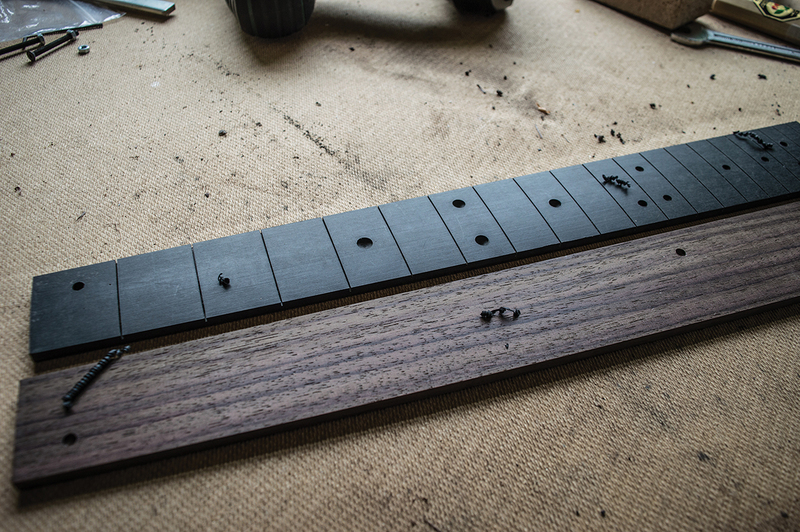 The Richlite ’board is now toast and there’s no going back, but gluing the rosewood ’board should be easy. It’s time to inlay the dot markers in the rosewood ’board. Martin’s ’board is laid out with numerous dots in various sizes, but I prefer a simpler layout. 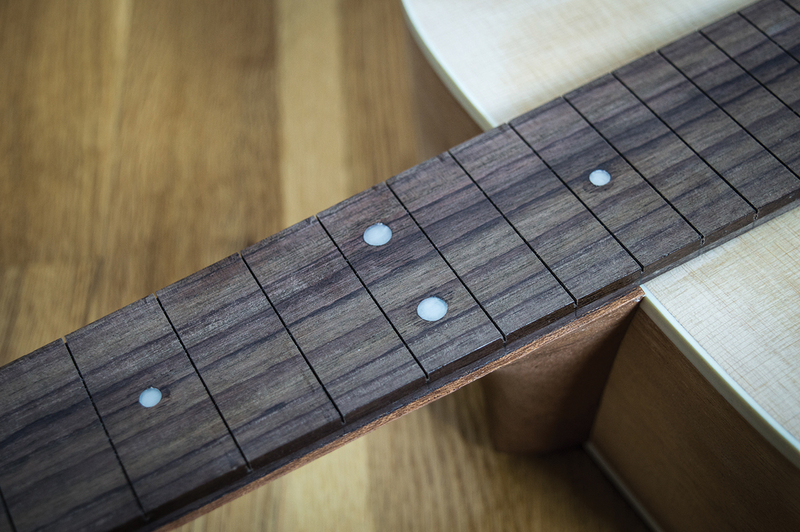 The centre points are located for the 7th-, 9th- and 15th-fret markers, then I mark two positions equidistant between the 11th and 12th frets, both 9/16-inches from the edges of the ’board. Since the parts all came from the US, the dots require Imperial drill bits. If you’re doing this, accurately measure the diameter of your marker dots with callipers and try your luck at a really good hardware store. Callipers or a micrometer are the best tools for measuring the diameter. When drilling, I start the hole with the drill spinning in reverse to minimise chip-out, and then switch direction to achieve the required depth. Super Glue is pooled into each hole and the pearl dots are tapped in with a rubber mallet. Go gently, because the dots can shatter. A little extra Super Glue is applied on top of the dots, to solidify the rosewood around the hole edges. A fret file has lurked in my toolbox for quite a while, but I don’t own a specialist mitre block for cutting fret slots. Accuracy is paramount here, and the saw must stay square and cut into the wood at 90°, so the frets will seat properly. Mitre blocks from regular DIY shops tend to have very wide slots, so they’re unsuitable for a fret saw that’s only 0.5mm wide. I decide to adapt the small wooden mitre block that I do have by fixing wooden guides to the sides of the block with double-sided tape. With the saw placed in the slots, I press each guide piece firmly against the side of the blade and then press it against the mitre block to fix it in position. In effect, I’m narrowing the slot in the mitre block to guide the fret saw properly. Since the rosewood ’board has been tapered to match the Richlite ’board, I mark the centre point at each end. 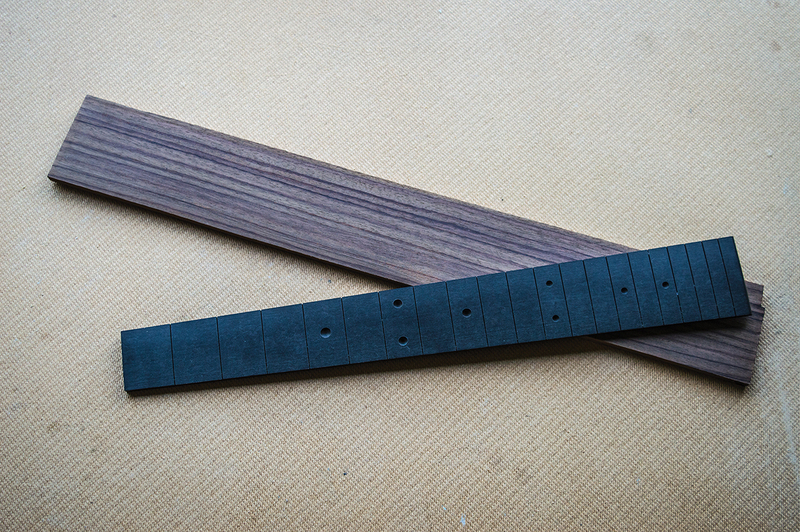 A centre line is then drawn on a straight length of scrap wood and the rosewood ’board is aligned, then taped onto the wood. Pressed against the inside edge of the mitre block, the wood’s straight edge keeps the fingerboard square and true. After placing masking tape depth stop markers onto the side of the saw blade, I very carefully position the first scored fret line under the blade, clamp the ’board down at each end and cut the first slot. It goes really well and after repeating the procedure 19 times, all the slots are done. Cutting the actual slots is quick, especially if you remember to apply beeswax to the saw periodically. The crucial bit is taking the time to set the blade and ’board as accurately as possible for every slot. It would have been so much easier to use the Richlite ’board, but despite the extra work, I’m pleased I didn’t. The new ’board still needs to be radiused and fretted before I can assemble the neck and fit it onto the body, but worry not – all that will come in the next instalment.